Billy Wilder's seminal 1950 movie Sunset Boulevard is a satirical gem that scooped three Oscars back in its day and is still ranked amongst the top 20 of American films of the last century. If you've never seen it, then read this review and then go watch it. A link to view the movie online is at the foot of this page. Wilder’s genius lay not only in his script and direction, but in hiring so many Hollywood greats to act in his meta-movie. Norma Desmond, his fictitious, faded Hollywood star was played by Gloria Swanson, herself a legend of the silent movie era. Cecil B. DeMille played himself and Max, her loyal butler was played by Erich von Stroheim, back in the day a silent-movie directing genius. So, it is a remarkable credit to Andrew Lloyd Webber, Don Black and Christopher Hampton that their musical is such a homage to Wilder’s classic. And in Lonny Price’s iteration, to see Glenn Close as Norma Desmond, offers perfection in casting. For sure, Close is not deranged (neither was Swanson in 1950) and nor has she been deserted by her fans (the adulatory cheers as she walks on stage in what is her West End debut, even before the final rave ovation prove that). But what Close is, is a Hollywood Legend of the grandest order, ranking in her generation alongside Meryl Streep, but not really many others. And that defines part of the magic of this production at the Coliseum. A Hollywood diva is in London, playing …a Hollywood diva. This will not happen often in our lifetimes. Sunset Boulevard makes for a sensational night in the theatre. Close, returning to the role that she created in the USA 20 years ago is a remarkable presence. 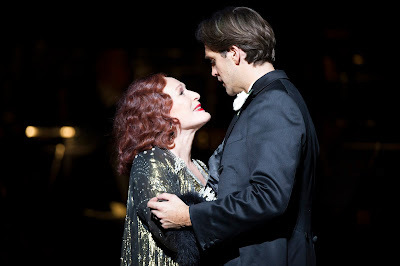 The show is at its strongest revolving around Norma Desmond’s mania and her two big numbers With One Look, defining how she filled the screen in her heyday and As If We Never Said Goodbye, sung as she makes a heartbreaking return to a Paramount sound stage, connect strongly with the pulse of the original movie. As the hack writer Joe Gillis, Michael Xavier is perfect. As his character is hardened to the trash of Tinseltown and possessing a body to die for (literally), there are few people in town who could match Xavier’s presence and vocal excellence. Opening the second half, his big number Sunset Boulevard defines Hollywood’s rapacious brutality. 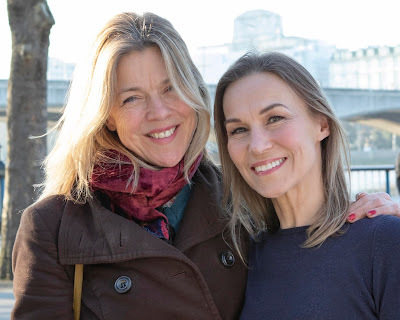 The youthful love-interest comes from Siobhan Dillon’s Betty Schaefer. Wilder created Schaefer very much as a two-dimensional, film-noir, femme fatale and Dillon nails the woman’s beautiful allure. Perhaps after Close, the most ingenious casting decision has been to select the Swedish Fred Johanson to play Max. Johanson not only brings the most carefully crafted interpretation to Madame’s “keeper of the flame”, striving to preserve the paper-thin illusions of her deluded world – but he is also a dead-ringer for von Stroheim’s creation. There’s not a lot for Max to sing in the show, but Johanson makes fine work of the haunting New Ways To Dream. The economical concert staging is pulled off with aplomb. Michael Reed’s on-stage 48-piece orchestra provide a lavish treatment of Lloyd-Webber’s score, whilst Stephen Mear’s inspired choreography makes versatile use of the Coliseum’s space and walkways. 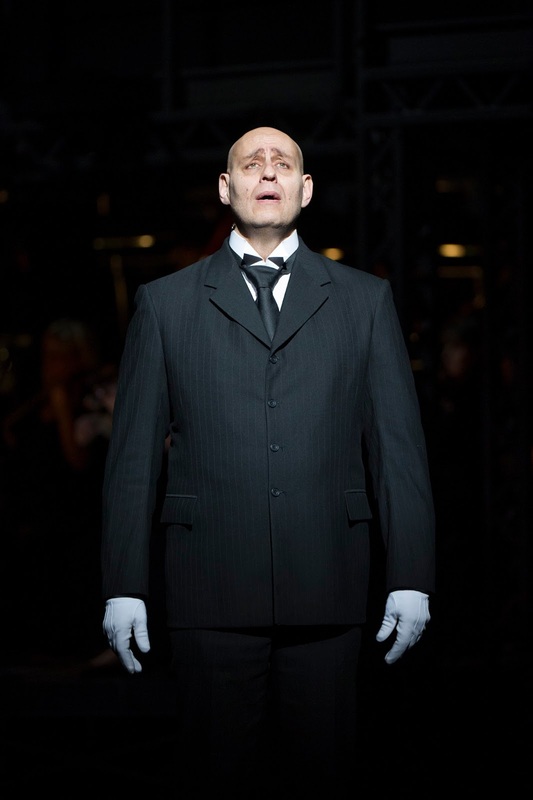 It all makes for a very stylish musical, Glenn Close's Norma Desmond proving unforgettable. Totally agree. This is not the greatest show ever written or even the best in London but the combination of GCs thrilling world beating performance and 5Star production values make it a must see event. Saw it Saturday. Loved it.